Hey, pal! Have you ever faced certain death before? I did. It happened to me whilst I was watching this rather nifty 68-minute movie made in 1943. It was Directed by: Roy William Neill; and Starred: Basil Rathbone, Nigel Bruce, Dennis Hoey, with Arthur Margetson. But then again, maybe it was just wind. Bbbppt! Sorry. No-No-No, good sirs! I must protest. I'm not drunk. Hic-up! I'm the butler. I'm the butler called Alfred Brunton (Halliwell Hobbes). And I see everything that goes on at Musgrave Manor. Everything. No matter how trivial it may appear to the outside world. Be it the bickering in the ballroom or the infirmed infantry-men in the corridors, one way or another, my eyes do the talking, more than my legs do the walking. 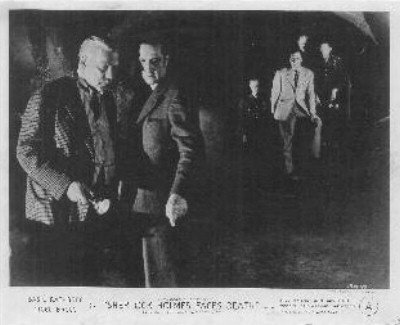 For instance, last night I saw Doctor Watson (Nigel Bruce) tending to Doctor Sexton's (Arthur Margetson) strange injuries, after he was bashed on the head by parties unknown. 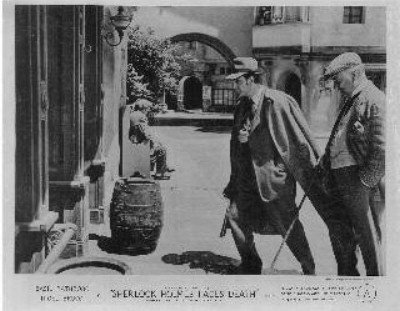 Then this morning I saw Sherlock Holmes (Basil Rathbone) interviewing those patients living at our stately home, once he discovered the dead body of Geoffrey Musgrave (Frederick Worlock) lying in the garden. And this evening, I saw Inspector Lestrade (Dennis Hoey) arresting Captain Vickary (Milburn Stone), because he suspected him of killing miserable old Geoffrey. Oh! Wait a minute! I almost forgot to mention something. Didn't I? It must be the brandy. Burp! But this very night, I saw Sally Musgrave (Hillary Brooke) nearly getting hit by a stray bolt of lightning, midway through reciting the age old Musgrave ritual. Yeah. I'm telling you no lies, good sirs. No lies at all. All of the Musgrave's appear to be in grave danger. Grave danger. Yet again, that's most probably why I get accused of killing Phillip Musgrave (Gavin Muir) the day after he sacks me for drinking on the job. DAMN! As clues don't come for free - a living chess-set is the very key - I ultimately turn up dead in the cellar - and at the end of the day, a vicious killer gets duped, whilst an heiress gets her feller. 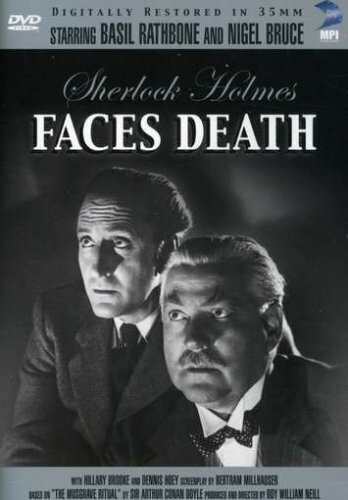 Despite catching a lousy bug -- which has made me feel like my head is on fire, whilst my throats is being strangled by a swarm of ants -- somehow, none of this has managed to stop my enjoyment of sitting down and watching, 'Sherlock Holmes Faces Death'. Yeah. I'm not kidding you, dear reader. Like many of the other Sherlock Holmes films I've seen so far, this one was also lavished with a very intriguing story-line to follow, plus all of that timely charm which usually comes along with this sort of production. Admittedly, the one thing I did find rather far-fetched, was that whole scenario where Holmes instructed the residence of Musgrave Manor to act as pieces in a chess game, who followed his orders for the sake of solving the aforementioned mystery. But apart from that very minor gripe -- nah -- this was one hell of a great story to watch. Bar none. What I enjoyed about it the most was how Holmes acted like a stern and level-headed figure all the way through it. Seemingly always knowing what to say or do from one moment to the next, without even appearing to show a hint of any heirs or graces in the process. Furthermore, I did like how Watson acted as a counter-point to Holmes. Always being at hand with a nice word to say, whilst he exhumed a very bumbling yet caring disposition. As for the story in itself, though -- well, yeah -- I suppose I kind of liked that as well. Even if parts of it was somewhat difficult to figure out, in spite of the main players being killed off one after the other as the plot progressed. But hey, you can't have it all, can you? And this slight nag was more than made up for by the great actor's involved plus the timely charm this film has in spades. Telling it like it is in a very no nonsense manner. Anyway. That's enough of that methinks. Cause this seems like a pretty good time for some filmic-facts. (1) 'Universal Studios' first released this production in America on the very same day that the Red Army recaptured Bryanskm -- the 17th of September, 1943. (2) The majority of this movie was shot at 'Universal Studios', Universal City, situated in the American state of California. (3) Loosely translated, this project was entitled 'Ghosts in the Castle' in Germany; 'Failed to Death' in France; and 'Sherlock Homes Dodges Death' in Finland. (4) This flick was limply based on Sir Arthur Conan Doyle's 1893 Holmes story, 'The Adventure of the Musgrave Ritual'. 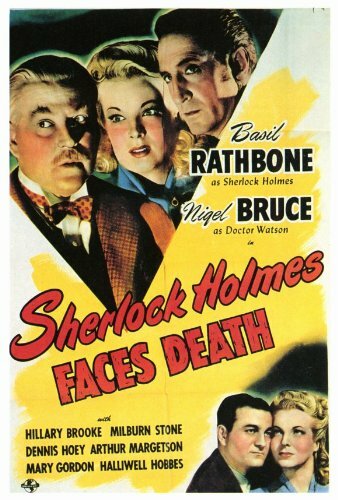 (5) Out of the fourteen original films devised at 'Universal', this was the sixth one based on Sir Arthur Conan Doyle's fictional consulting detective, starring Rathbone and Bruce as Sherlock and Watson. (6) Bertram Millhauser, who adapted this film into screenplay form, once worked for the legendary Cecil B. DeMille as a writer and a producer. (7) Its a little known fact that the director of this thriller, Roy William Neill, was originally called Roland de Gostrie, and he was born on a ship off of the coast of Ireland. (8) After this flick waxed lyrical, both Basil Rathbone and Nigel Bruce played a pastiche of their Holmes and Watson partnership in the musical-comedy, 'Crazy House'; whilst Dennis Hoey played a priest in the crime-drama, 'Uncertain Glory'. 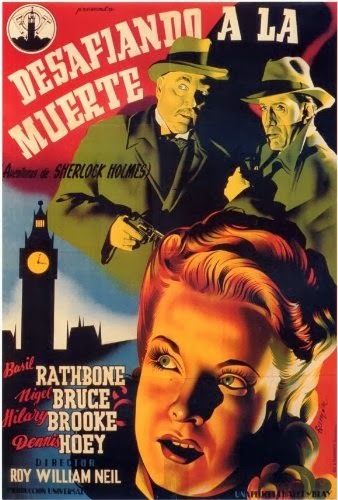 Overall I'd say that 'Sherlock Holmes Faces Death' was a pretty nifty film to follow. The characters showed character. The story-line was an engrossing one to watch. Plus if anything did let it down, it would have to be that at times it was kind of difficult to figure out. But then again, I have caught some sort of bug. So maybe it's just me. Sniff-Sniff! Nuff said.